Above: a Coelioxys Cuckoo Bee with its unusual sharply-pointed abdomen tip. 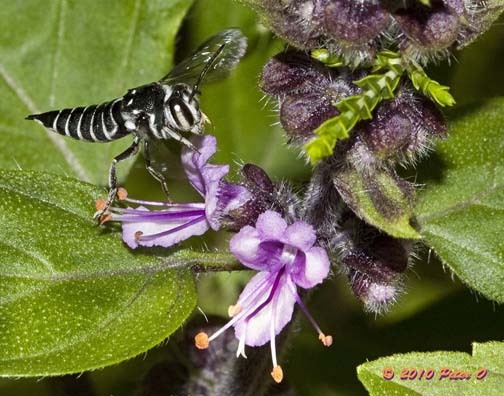 Photo by Peter O.
Coelioxys Bees are cuckoo bees (or 'cleptoparasites') which lay their eggs inside the nests of other types of bees, in a similar way as cuckoo birds lay eggs in the nests of other types of birds. Coelioxys Cuckoo Bees lay their eggs in the nests of Leafcutter Bees, just as the Neon Cuckoo Bee lays its eggs in the nests of Blue Banded Bees. The Coelioxys Cuckoo Bee enters the nest of a Leafcutter Bee and uses her long tapering abdomen to insert her egg in between the layers of leaf forming a leafcutter bee brood cell, into the pollen mass inside. 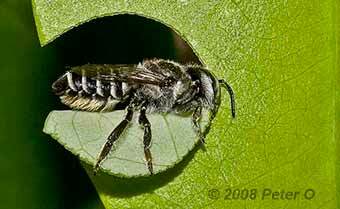 The eggs hatch into Coelioxys larvae which kill the Leafcutter Bee young and also eat the food stored for them. There are six species of Coelioxys Cuckoo Bees described in Australia and they are found Australia-wide. The Coelioxys Cuckoo Bees are about 6-12 mm long and belong to family Megachilidae.